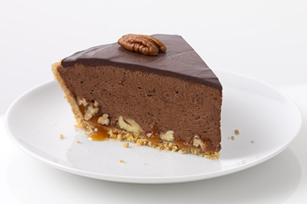 We took the flavors from the classic caramel, nut and chocolate candy treat and made a pie. How'd it work out? Amazing, if we do say so ourselves. Spread caramel topping onto bottom of crust. Reserve 10 nuts for garnish. Coarsely chop remaining nuts; sprinkle over caramel topping. Beat pudding mixes and milk with whisk 2 min. Stir in 1 cup COOL WHIP; pour into crust. Refrigerate 2 hours or until firm. Microwave chocolate and remaining COOL WHIP in microwaveable bowl on HIGH 1 min. ; stir until blended. Spread over pie. Top with reserved nuts. Let stand 10 min. before serving. Looking for a dessert for your next party? At 10 servings, this delicious pie makes enough to feed a crowd.